Free DLC for Lego Worlds. 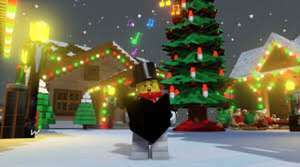 Simply make sure you update to the latest version of software and you will receive a completely free Christmas theme world. This new Winter Wonderland DLC pack is an amazing gift from the LEGO Worlds team (normally $3.99). Much like the Classic Space or Monsters DLC, this is packed with new characters, quests, vehicles, objects and biome. While not as robust as the paid DLC, this is definitely a great surprise treat! Do you need to own the game to get the theme? Just bought this for the kid for Christmas but i had better load it up now to make sure i get the DLC. Is it across all platforms? does this work for xbox one version? Is it available for the switch? anyone actually found this yet?? How does this work? Just load up the game or is there a link or code? Edit: Did my own research. Ignore the link in this post, game must be loaded up. ‘In Adventure Mode you can find the Winter Wonderland Biome on the outside edge of your galaxy map (highlighted with a Candy Cane icon). After you explore this world you will be able to find it in your “Create New World” option. Get ready to discover tons of new objects related to the Christmas season, with great brick builds to follow all month long! This is going to be magical! In Adventure Mode you can find the Winter Wonderland Biome on the outside edge of your galaxy map (highlighted with a Candy Cane icon). After you explore this world you will be able to find it in your “Create New World” option. Just ordered it for the Switch this week so hope you're right. Why can't he play Minecraft? I've battered Minecraft over the years. You're right it takes over your life. Is lego worlds any good? I've battered Minecraft over the years. You're right it takes over your …I've battered Minecraft over the years. You're right it takes over your life. Is lego worlds any good? This is out now on PC and Switch as well. Nice freebie!